I was talking to some ‘griddler’ friends of mine recently about the joys of living inside the New Forest perambulation. (A griddler is a local term for a non-commoning person who lives inside the cattle-grid zone of the New Forest.) These friends love being part of a village community in which, of course, they include the commoner’s free roaming animals. Their cottage is picture-postcard perfect, with a thatched roof, and fragrant honey-suckle and pink roses over the door. It’s always a pleasure to visit, particularly as I am usually greeted with a large mug of coffee and a fully loaded biscuit barrel. Their home overlooks a small green that is separated from the property by a busy village road. A short distance away is a crossroads where visitors must choose carefully the direction they wish to go in order to either access the Open Forest, enter a dead-end track leading to other properties, travel further to the village centre, or return back the way they had come. To aid the visitors in their choice is a signpost, located on the green. This simple structure, a black and white name board suspended between two round wooden posts, stands alone informing passers by of their location. Apparently this road sign leads a double life. According to my friends, not only do cyclists and walkers perch or lean upon it while consulting their maps and phone apps, but the ponies, donkeys, and cattle use it as a scratching post. In fact, the height of the road sign is so accommodating that some of the taller ponies are even able to straddle it in order to relieve the itching to their undersides that teeth or hooves are unable to reach. The majority of the ponies and donkeys, however, seem to like to rub their rear ends up and down the posts, as if giving themselves a massage as well as scratching. My friends refer to this as ‘bottom flossing’, because to all intents and purposes that’s exactly what it looks like the animals are doing. 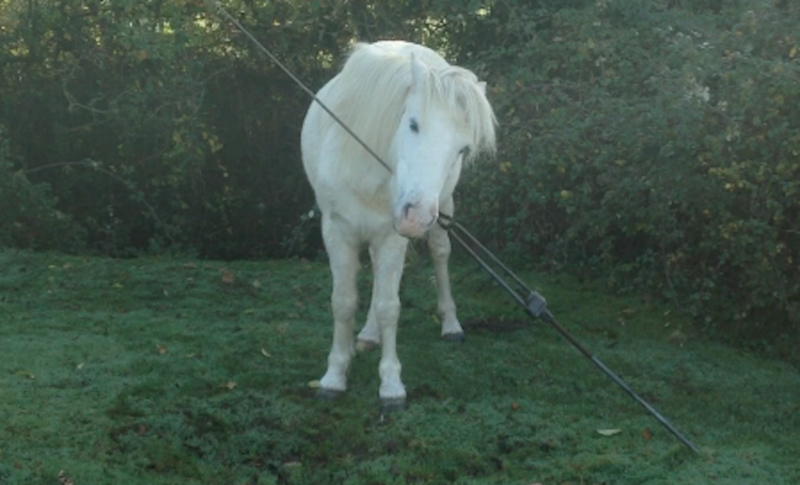 New Forest ponies are very clever animals and they are also opportunists. I have seen for myself a pony using the horns of a cow, which was lying down and chewing her cud, to scratch itself. Many of the cables on the Open Forest, which support telephone poles or other infrastructure features, are often used for the same purpose (see photo below). It’s not unusual to see these large metal cables with a tidemark line of hair-encrusted dirt up to several feet, or a metre or so, from the ground. My friends, however, are often concerned about the visitors who rest on the signpost outside their cottage. They have no doubt that if these people knew how (and particularly where) the animals used the sign they would probably avoid it altogether or at the very least wash their hands after touching it. 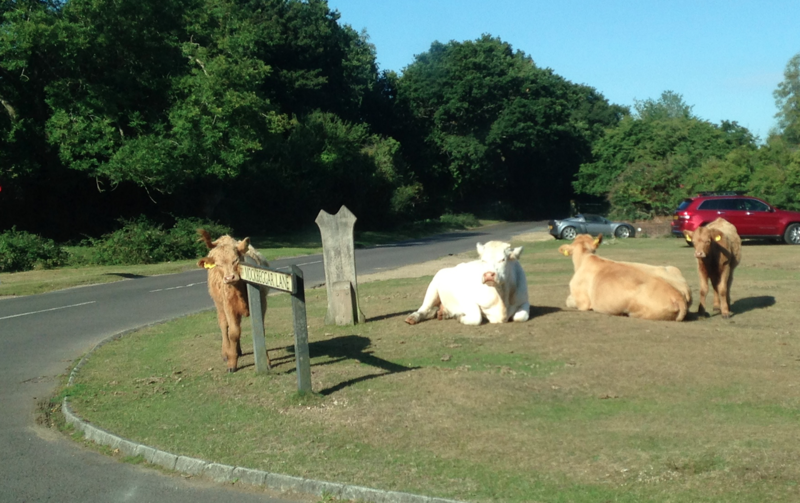 This entry was posted in New Forest, New Forest pony and tagged bottom, cattle, Cow, donkey, flossing, itch, massage, New forest, pole, ponies, pony, post, road, rub, scratch, sign. Bookmark the permalink.